Pillbugs and sowbugs belong to the crustacean class and are the only crustaceans that have adapted to life on land. Pillbugs, sometimes referred to as roly pollies due to their tendency to roll or curl up into a ball, and sowbugs are considered occasional invaders within the pest industry. Sowbugs differ from pillbugs in that they are unable to roll up into a ball and have two tail-like appendages. Pillbugs and sowbugs have oval bodies with a head and body comprised of an abdomen and thorax. The thorax contains seven hard, overlapping flexible plates. Pillbugs and sowbugs have seven pairs of legs. Pillbugs and sowbugs are garden pests that prefer moist environments. They are typically found hiding beneath rocks, stones and other damp locations such as beneath garden debris and mulch in the soil. Homeowners also report finding them beneath potted plants and trashcans. They are most active during nighttime hours since their bodies lose moisture quickly. Pillbugs and sowbugs feed on decaying plant and vegetable matter and other foliage and crop debris. These harmless pests may come inside occasionally, but are not able to survive without damp soil conditions and usually dry up quickly and die. They may also venture inside sheds and garages and other outbuildings. 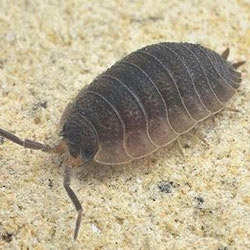 Pillbugs and sowbugs do not bite and are not likely to lay eggs indoors; therefore, there is no threat of an interior pillbug or sowbug infestation. Pillbugs and sowbugs do cause damage to plants and can become a problem when they invade gardens. AmeriGuard Pest Defense offers pillbug and sowbug control services for areas where pillbug and sowbug are a common occurrence. Our licensed service technician will perform a thorough visual inspection to identify the severity of your pillbug and sowbug problem. During the inspection, all sources of the pillbug and sowbug infestation will be identified and methods of pillbug and sowbug treatment will be discussed. The technician will also point out potential pillbug and sowbug harborages and suggest mechanical methods of pillbug and sowbug control where available. A successful pillbug and sowbug control service depends on the cooperation of our customers. Pillbug and sowbug treatment services are available on a One-Time basis or as part of an ongoing Monthly or Bi-Monthly General Pest Control service. Reduce mulch levels around the yard and in gardens to eliminate moisture sources. Elevate flower pots so they are not resting directly on the ground. Eliminate unnecessary rocks and stones that provide hiding sources. Raise firewood off the ground and move away from the structure. Encourage ventilation in moist locations such as subareas and crawl spaces beneath raised foundations. Contact your pillbug and sowbug service experts at AmeriGuard Pest Defense for a pillbug and sowbug treatment quote. Most quotes for pillbug and sowbug services can be provided over the phone without any obligation. AmeriGuard Pest Defense’s General Pest Control Maintenance Program includes control for pillbugs and sowbugs. No contracts required! Both the inside and outside of your home are always under warranty with a Maintenance Program. AmeriGuard’s Pest Defense Program guarantees your satisfaction between regular scheduled maintenance with unlimited free re-services. If at any time you find yourself in need of an additional treatment between regular scheduled services, call us and we will return to re-treat your home absolutely free!